Attorneys say former jockey Ricardo Valdes will plead guilty to sports bribery charges involving fixing races at Tampa Bay Downs in 2005 and 2006. Two Detroit area businessmen were also charged in the case for paying jockeys to influence the outcome of races. 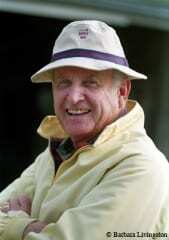 Former New York trainer George Weckerle Jr. died November 30 in Arcadia, California, his family announced. He was 93. Weckerle’s most well-known stakes winner was Arbees Boy, who upset Forego at 60-1 in the 1974 Metropolitan Mile at Belmont Park. Saturday is Louisiana Champions Day at Fair Grounds – with a card devoted entirely to Louisiana-bred horses. For some horse owners, it’s the biggest day on the racing calendar. Buffalo News racing blogger Gene Kershner has come up with his holiday shopping list for the racing fan. You might want to pass it along to friends and family members – hint, hint. Trainer Daniel Smithwick Jr. will go back to work this weekend at Turfway Park after being released from the hospital Wednesday. Smithwick has been recovering from serious injuries sustained during a fall down a flight of stairs several weeks ago.